Copper is a material which is very difficult to mark, but using a multi waveform process can be marked with a selected few colours with very high contrast. Manufacturers are greatly interested in this process, looking for new methods and finishes to provide product customisation. The challenge with processing copper is the materials high reflectivity, therefore high peak power is required to ensure enough radiation is absorbed to process the material. Applying a multi waveform process, the first pass uses high peak power and pulse energy to create a base for the second pass. The second pass then uses a variety of pulse durations, scanning speeds and pulse repetition frequencies to produce marks in a range of finishes. 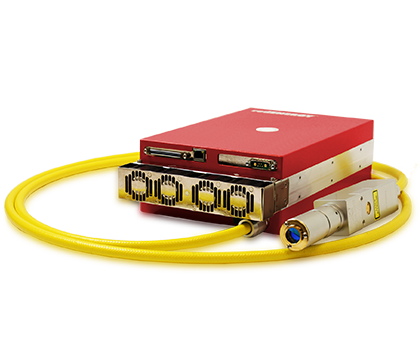 The flexibility of the G4 laser allows pulse duration and frequency to be changed on the fly so the second pass can take place immediately after the first. Scanning speed is very high for this process, so the total processing time is short, about 8 seconds for all the presented text. This speed however depends on the shade of mark desired. 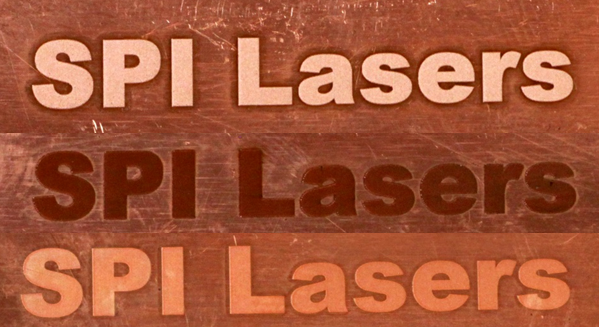 SPI’s G4 20W RM-Z laser is able to produce high quality marks on various grades of copper in colours and shades including white, brown and orange as seen to the right. Watch our Copper Marking Application video here!